“As a facilitator Anita brings not only her wealth of experience in developing school grounds but also a genuine empathy for working with young people and an irresistible enthusiasm for her subject. 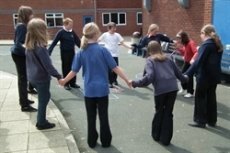 Her sessions are always interactive and ‘practise what they preach’ by making use of outdoor spaces whatever the weather!” Alan Strachan, Director of Extended Services, Churchill Community College. 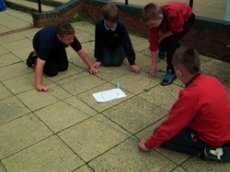 Growing Together was a partnership project between 5 schools, a secondary, Churchill Community College, and four of its feeder primaries exploring how school grounds projects could help pupils make the transition from primary to secondary school. 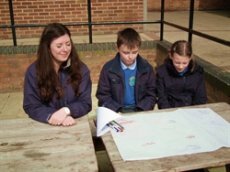 The aim was for individual schools to consider and improve the use, design and management of their grounds for all, using this process to support the transition of pupils from primary to secondary school. Projects within schools were led by a pupil team, with involvement from pupils from all year groups as well as staff. 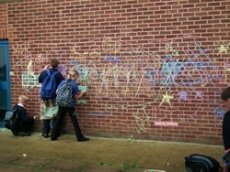 Pupils moving on will leave behind a legacy whilst taking with them the things they think are important about their outside space and these will hopefully influence the grounds of their new school. Pupils from the different schools met to share experiences and ideas throughout the programme, and each school will had an advisory site visit along with additional ongoing support. An event was held at the end of the school year to share and celebrate the schools’ achievements. The project team was made up of a small group of Year 7/8 pupils, led by the Director of Extended Services. 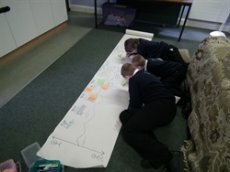 They started by developing a presentation about the project to be displayed on the school’s plasma screens and developed questionnaires for staff and students. The group held regular, minuted meetings to help them focus and prioritise their activities, and continuously updated staff and pupils alike as to their findings and progress. An obvious need was for more places for pupils to sit and meet at lunchtime. The group worked with VI Form Humanities students to identify potential locations for additional seating. They surveyed the site and produced a report outlining the pros and cons of various locations. The Growing Together group then visited each tutor group in the school asking for them to vote for their preferred options. New benches were researched, costed and ordered and will be located, along with new rubbish bins, in the preferred locations. The group presented at the local Education Action Zone (EAZ) conference explaining the Growing Together programme and their school’s project to a group of Head Teachers from the Zone’s schools. The Growing Together project has “sowed the seeds of lots of different ideas and given us an action plan to build on.” They feel the project has helped them see the potential of their outside space, but that they are just at the start of working to realise this potential. The self-esteem of the lead group of students has increased and it is hoped that new pupils entering the school, particularly those who have been involved in their primary school’s project, will join the group to work and continue the project.